Segmentation has been thrust in the limelight recently and rightly so, due to the sheer benefits companies gain from doing so. If you cast your minds back to the astonishing $3.6 Billion deal that was conducted last year, between between Equinix and Verizon, you'd understand that good segmentation is highly sought after. With that being said, over the past years, publishers such as SourceMedia, Access Intelligence, and Agora Financial, have all made the move to implementing Customer Data Platforms. Customer Data Platforms, or CDP’s in essence is a technology that gathers customer data from a publisher’s website, and forms individual specific profiles. The CDP then helps the publishers analyse and depict this data. This process is also known as segmentation. Now a lot of companies as stated above are great at gathering data, and have stores of it, however many don’t actually do anything with said data. You’re now probably asking what can you do with it all, and how can data possibly be this important? This is where personalisation comes in. Now with this information in mind, personalisation is taking these segments into consideration, and further analysing them and refining this information. Personalisation tailors highly relevant content on an individual and personal level. Personalisation is about improving the one to one customer experience and by sending them an individually specific offer. For example; whilst you may have segmented two people that are females and use the same operating system, one may be 22, and one may be 63. The personalisation goes deeper in the segment and individually tailors specific offers to each individual person. So you could personalise by sending the 22 year old an offer to BuzzFeed, and the 63 year old an offer for The Guardian. 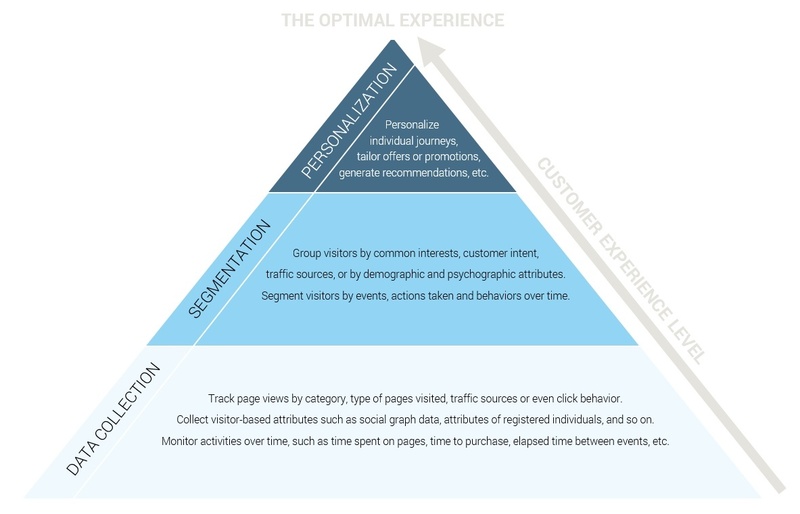 A simple way to fully understand the differences between personalisation is by analysing a framework developed by Dynamic Yield, called the Pyramid of Personalised Experiences. (See fig.1). The pyramid in essence simplifies the journey through data collection, segmentation and finally personalisation. As you well know, data collection is the first phase of all of this. Having large amounts of customer data is arguably the most important point of segmenting. Making sure you have a large pool to nit-pick will make segmenting easier. Now whilst you may think, who simply has the time to go through all of this data, have a read on how Machine Learning can aid with this. The greater your data, the greater your findings when you fine comb through it. Once you have your banks of data, you can begin to place it into different groups, and start looking for correlations. As stated above, segments can be anything you could want them to be, from midnight users to NBA followers, be as broad as you wish. The goal is to find similarities. This is where the money is made. You’ve gathered your data and identified who browses from certain locations, at certain times, using specific operating systems – now it’s time to act on this. Some personalisation models will email offers to certain users, but with Evolok, we can give real time, personal offers. Offers based on location, time of day, gender etc. This is where some marketers are not making the most of their data. According to Tune, 84% of millennials act on location based notifications. So why not make the most of this? Why not maximise your potential and make sure to send out real time offers to visitors, and increase user engagement. To conclude, I too can understand why there’s a slight confusion in regards to segmentation and personalisation, because they certainly both have similar characteristics that overlap each other. The main thing to remember, is personalisation is segmentation on steroids. The startling thing is a lot of companies will collect and store their data with multiple different providers, making it impossible to segment and personalise properly. My personal opinion and advice is store all of your data in one place, not only is it safer against cyber-crime, you’ll also be able to access far more information on your readers/customers that you can analyse, and ultimately monetise. Once again, you don’t necessarily need to go out and hire 100 employees just to gather and segment your data. Now you may be wondering, where does Evolok come in with all of this. Evolok has the ability so offer real time personalisation. What this in turn means, is that whilst a customer is on a website that's running the Evolok plugin, they are actively getting personalised adverts and offers to them in order to maximise revenue. allowing both real-time segmentation, and personalisation, we are able to deliver a new dimension of engagement to drive interaction. Being able to identify customer types allows for engagement to take place when it matters most. Don't hesitate to contact Evolok for a demo.